County of Lennox and Addington (Upper Tier Lennox and Addington)Record Owner? Log in. 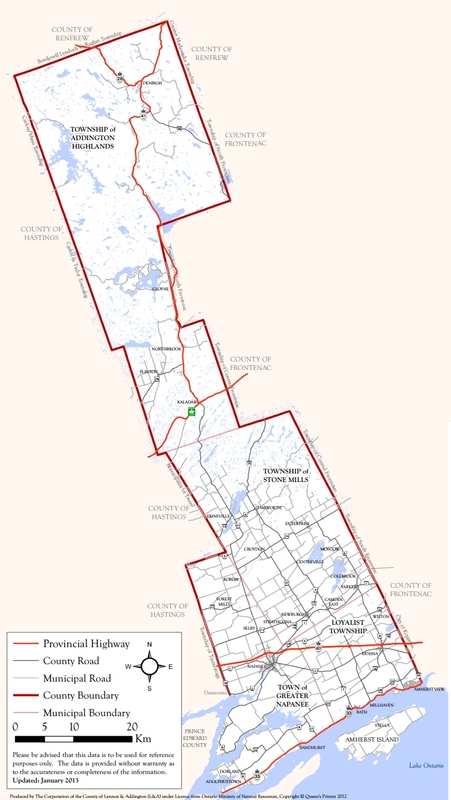 Lennox & Addington is accessible from Highways 401 (halfway between Kingston and Belleville), 7 (halfway between Ottawa and Peterborough), 41 (Algonquin Route), 28 (from Bancroft), and 33 (the Loyalist Parkway). Home of Bon Echo Provincial Park, Loyalist heritage, the Blueberry Jamboree, historic towns, antique shopping, and quiet tea rooms. Stay at one of the rural bed & breakfasts, local inns, motels or campgrounds. The Cataraqui Trail, Trans-Canada Trail and (soon to be) Waterfront Trail make for excellent cycling and snowmobiling. Visit the Lennox and Addington County web site at www.lennox-addington.on.ca for a complete calendar of events and details on all of the above. Have something to say about County of Lennox and Addington (Upper Tier Lennox and Addington)?